The world’s largest airplane, built by the company owned by late Paul Allen company, Stratolaunch Systems Corporation, has made its first test flight. The aircraft, a carbon-composite plane, took off on Saturday from California, United States, over the Mojave Desert in California. The white airplane called Roc, nicknamed after a giant mythical bird, has a wingspan that has the length of an American football field. It is powered by six engines on a twin fuselage. It stayed aloft for more than two hours before landing safely back at the Mojave Air and Space Port. 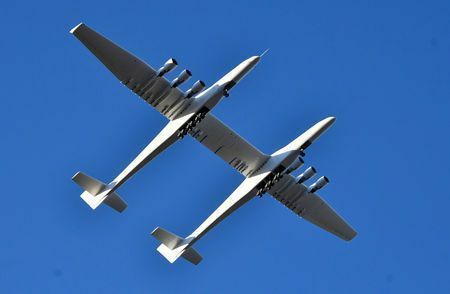 Jean Floyd, Stratolaunch Chief Executive, said in a statement on the company’s website: “What a fantastic first flight. The flight, which saw the plane reach a maximum speed of 189 miles per hour and altitudes of 17,000 feet, was meant to test its performance and handling qualities, according to Stratolaunch. Allen, who co-founded Microsoft with Bill Gates in 1975, announced in 2011, that he had formed the privately funded Stratolaunch. Allen died in October 2018, while suffering from non-HodgKin’s lymphoma, months after the plane’s development was unveiled.